In the recording and concertizing world of mainstream classical piano, Andras Schiff has become perhaps the leading light in the generation behind elder elders and younger elders—Brendel plus Kovacevich and Goode, then Perahia and Lupu—while senior to the comparative youngsters Lewis and Fellner.In Schiff’s lengthy Celebrity Series recital last Friday night at Jordan Hall, the master showed up late. Note: Pianists Sergey Schepkin and Katherine Chi are reviewed below. Schiff began his Himalayan endurance trek with Bach’s Goldberg Variations in what was, alas, by some measure the worst professional piano performance this reviewer has ever heard. Measure for measure, note group for note group, Schiff’s rhythm was flabby, without beat, unrelievedly slack, distorted where not shapeless. The work’s brisk beginning was not completely clean, not completely strong; by variation 3 and 4 every pianist has got the pulse, but not here. It wasn’t the common matter of introducing hand and fingers to metronome; that’s just how this man plays Bach: unfixable, as his numerous CDs evince. Even when Bach hands out the clicktrack (which he does much of the time, e.g. variation 12), Schiff might begin pointed and loud but then would weaken, unable to sustain the beat, lapsing back into helpless wandering with a kind of innately faulty rubato. You might say the rubato was random, but that’s not really right; it’s more automatic, arrhythmic, with the fact that the hands aren’t together not the result of the usual fancy keyboard robbing and staggering of time for effect, but a simple failure to feel regularity. Variation 14 finally began to shape up, it seemed, and variation 15 lacked poetry and perfume to a nice degree that I quite liked … but in each, forced, halting rhythms soon dominated again, meaning no line, no downbeat, no upbeat. The lefthand generally played too loudly, but ppp was never to be heard in any case. An elderly friend in the audience who likes to quietly conduct rhythmically gave up on each variation after only a few seconds into it. Of 17 and 18 I scribbled that it’s actually hard to play like this. I kept expecting it all to improve, naturally, with Schiff coming to feel it, growing involved, excited, and making the piece involving, exciting. But no. My ticket date, a recovering musician and critic, fled this nearly soldout recital the instant these anodyne Goldbergs ended. Since Schiff is the opposite of a rhythmically strong Bach pianist, his large recording career with that composer is dumbfounding. You would not think he has any use for Bach, even in the slow, brooding minor variations, also that Bach for him somehow lacks pulse fundamentally. A telling sign: Schiff’s feet remained stock-still throughout, and it wasn’t just because he does not pedal Bach. Now, it’s true that Denk’s Goldberg feet were like Jerry Lee Lewis, autonomously flailing throughout, and in solid time. But Schiff’s inept trilling, frequent rushing including chronic speedups/slowdowns, and failure to truly get Bach’s weird syncopations made it all feel, well, like a recital by a talented but ultimately not that good young student. It’s not that Schiff hasn’t thought about the work, of course: his extensive and imaginative (too imaginative for my taste) program notes consider important architectural or structural points, where he observed long pauses. Two of Schiff’s teachers were George Malcolm, whose chief harpsichord virtue was that he got Bach’s motor (meaning understood it, honored it), and Sandor Vegh, whose Mozart swing is unsurpassed in its Ellington quality. Schiff’s official recordings of the Goldbergs aren’t this bad. Let us conclude by presuming that the artist’s hands were having an unusually weak night. After the break, the marathoner transformed into some other musician, and it was a new Schiff who returned to the Jordan Hall stage, to take on Beethoven’s multifarious Diabelli Variations, a journey from peak after peak. I had had to prepare myself, also knowing what similar Beethoven lay ahead on Sunday, and to spend a weekend immersed in the mysterious, magisterially controlled imagination of this composer over the last five years of his piano-composing life remains very close to an overwhelming experience. Schiff likes this piece. He began the waltz on the fast side. The first couple of variations felt not queer enough, not accented enough. But over time and by turns, Schiff engaged with the music in meaningful, serious, witty fashion. There were phrasing, inflection, dash, inwardness; on occasion sun broke through with a smile. (Schiff still doesn’t show the poise and the crystalline, unlabored crispness of a Meng-Chieh Liu or Minsoo Sohn; recently hearing Liu twice has surely spoiled me.) Schiff again lacked the last measure of strength in Beethoven’s 3 vs 2 or 3 vs 4 writing and his rhythmic perversities elsewhere; some iambs could have been more agogic. But this confident performance dissipated the Bach weakness; rhythmic flab is impossible in Beethoven such as this. In variation 13, with its possibly thundering dactyls, Beethoven’s pauses presaged Victor Borge, and a playful Schiff had the audience laughing both times. I don’t think I have ever seen delighted gasping quite like that before. The pianist proceeded to roll along, feeling it, Beethoven’s wit snarling or sly. Variation 16 rocked; Schiff’s left hand (which was loud throughout) boogying steadily up the octaves and then cornering perfectly and without pause to boogie back down. It was not quite at the Kovacevich and Lewis level, but close, and better than many. (A YouTube clip here seems to me telling about Schiff’s unsettled beliefs about and feeling for rhythm: in it he disavows, explicitly by name, any boogie-woogie notions for the rhythmically similar Opus 111 variation. Good thing he did not take his own counsel for Opus 120.) By the end Schiff was fully in all the moments, feet moving, driving the splendid fugal momentum unto the crisp Mozartean last variation with its endlessly reflective and reintegrating music box. The performance had become a Beethoven conveyance anyone would want to return to for study. “Don’t call him back,” murmured someone in the aisle eagerly getting set to leave, “he might play the Handel Variations.” It had been a long evening. But then Schiff launched into the last movement of Opus 111. Someone coughed, loudly because the Arietta begins so quietly, and Schiff stopped cold, and finger-wagged the offender. Now, the propensity to cough and clear throats whenever there is quiet is another of life’s mysteries, and every serious music-lover must go to heroic lengths to make no noise (I knew a reviewer who would practically lean under the seat with his face buried in his coat if a cough came on), and everyone must pack strong coughdrops (some venues even have them available in mint dishes). But stopping to chide, seriously? The remaining audience again laughed, this time uncomfortably. Schiff started over, and proceeded to spin out a transcendent performance, wondrously clanging the open chords at the end after the tension had relaxed and the heavens had opened and all was exhaled. 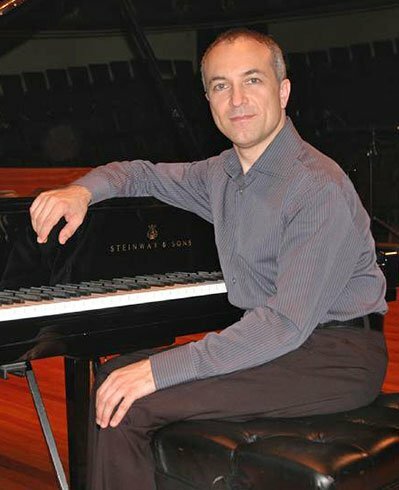 The Sunday afternoon late-Beethoven piano recital at Emmanuel Church for Emmanuel Music featured Sergey Schepkin playing the last Bagatelles and opus 110 and Katherine Chi the Diabelli Variations. More to ponder. Bagatelles are akin to ‘trick pieces’, artistic director Ryan Turner informed us in brief remarks beforehand. The comprehensive program notes began with his Opus 126 contribution; Russell Sherman commented at his most helpfully poetic on opus 110, and an excerpt from the amazing Diabelli essays of William Kinderman completed the content. Schepkin, of slightly severe mien, found sturdy ways to punch forth the weird Bagatelles, although here too some smiling might have been favorable, as not a few passages conjured Shostakovich or Prokofiev. In all of this keyboard work from 1819 through 1824 we are led to stand before Beethoven’s deep fondness for fugue, chorale, near-medieval styles including seemingly primitive canon, while also thinking ahead, to the divine, to future worlds of an almost ethereal metaphysic. Beethoven looks back to Bach, different Bachs in fact, and forward to Brahms (Diabelli variation 20 to some extent); he pays humorous, also serious tributes to Mozart, dead almost three decades when Diabelli’s postwar fundraising project was launched. Beethoven honors his favorite composer Handel more than once. And sometimes he peers ahead to a Zen future, of Haydnlike simplicity. Turner noted that the Bach fugue study was partly in preparation for the Missa Solemnis. Regardless, by the end of many works—this is truer in the sonatas than the variations—there almost always has been detailed struggle during the transition from feeling really bad to relief, of … what? Some sort of better is all we can tell. Sometimes the music embodies only the approach of relief, other times the relief itself. This struggle gets sonically dramatized in the most probing ways, thereby physically persuading us of the very process, as Charles Rosen put it. With Beethoven many would not quite call it healing, and in the Diabelli it is triumph, but with what sounds like to me a satisfying and amusing slight letdown. Schepkin’s Opus 110 began somewhat stiff and square. I thought it might be partly the Emmanuel Steinway, but Debussy recordings by this pianist exhibit the same slightly tight and unlilting characteristic. (There’s a brutal Mussorgsky recording as well.) Phrase openings sounded pushed, marchlike; Schepkin has rhythmic strength but sometimes of a stereotypically Germanic sort. This inelegance suits other musics, true. One peculiar penchant is that even in recordings Schepkin regularly rushes cadences in order to prepare for next difficult passage; it’s puzzling no one seems to have mentioned this to him. A reverse emergency rubato, if you will. He momentarily flubbed his way in the Scherzo. But then, but then: the force came to him, the force was with him, he relaxed, and the last movement’s fugues were just tremendous. Such screw-tightening, such triumphs. 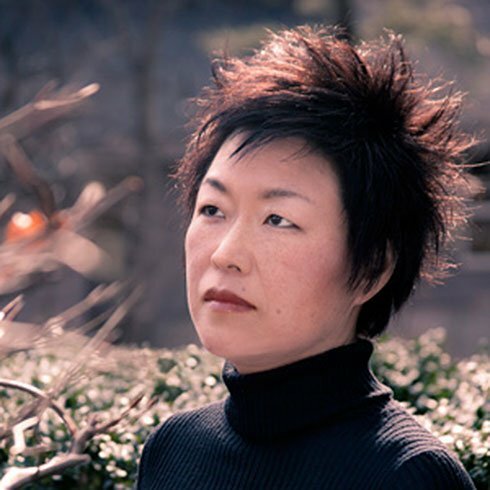 Katherine Chi similarly did not start out as the last word in elegance or relaxed intensity. (She has a Hammerklavier recording that’s a bit tight and squared-off.) The Diabelli opening waltz and variations felt tense, unplayful; some trills made messes. But then she too, after rocking through variation 16, began to ease, and the entire second half, particularly the last third, showed off increasing imagination and sensitivity to a high degree. Chi came into her own, listening into her playing. This may sound like faint praise, but it is not, believe me, as here is where Beethoven really gets going in his time travels, and Chi fully lit his varied facets: manic, formal, pedantic, show tune, haunting, chromatic. The last slow variations sang gravely, Goldberg-like, and the Fugue gripped its dissonances and transitioned in riveting fashion to that closing music-box Menuetto, its final chord for once not banged out, indeed treated with an effective, defocusing half-pedaling release. I’ve never heard it done that way. Now I want to hear all three of these pianists in more late Beethoven. The review of the Schiff recital is immoderate, but I am mostly in agreement with it. I have never much liked Schiff’s Bach, but have gotten a great deal of pleasure out of his Beethoven, and that was repeated here, except that the Goldberg Variations were worse than I expected and the Diabelli Variations better. And I certainly did not expect that encore, which was by a large margin the high point of the evening. In the Bach Schiff was plodding, graceless, humorless, colorless, and dull. His Bach is getting worse, not better. What makes it worse is that he seems to regard all these faults as virtues, which is a threshold from which few return. He did however achieve the remarkable technical feat of managing to sound over-pedalled without ever touching the pedals at all. In the Diabelli Variations he was, as David Moran says, much freer and more involved with the actual work rather than with some perverse ideal. He does not really grasp the point of Beethoven’s biting wit, but he mimics it well enough to be convincing; it is like someone without much of a sense of humor getting a laugh by telling someone else’s jokes. I also do not believe he has any real grasp of the mysterious melancholy ecstasy, unmotivated and rootless, of the the three C-minor variations, but just puts his head down and does what the master asks, and this work well enough. The encore was at a different level, as if he was entirely absorbed into the substance of the music. Of course he has played it a lot of times; in a way it was like the performance of a ceremony. It worked for me; I left in a state of grace. 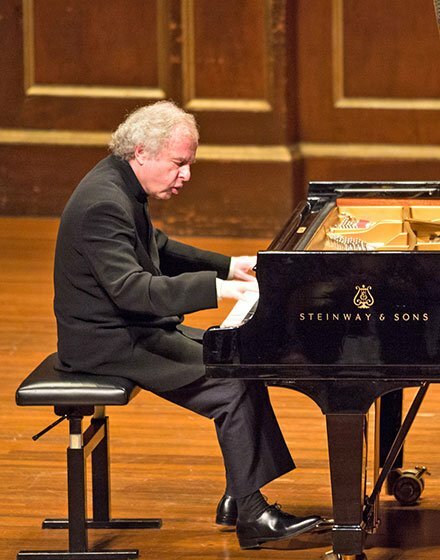 I attended Andras Schiff’s solo piano concert last night at Jordan Hall, part of Celebrity Series, in which he played the Goldberg Variations and the Diabelli Variations. A long, crystal-clear, and intelligent rendering; I’m very glad I heard it. I wasn’t so charmed by the encore. A few minutes into the long encore to an already long, serious program–a woman behind me gave two small, quiet, involuntary coughs. Mr Schiff stopped playing and said something like “If you are sick please go home. I am giving the audience a gift here” and then resumed playing. I have never witnessed anything like this. To stop playing and upbraid the audience, and one person in particular, seems a breach of decorum. Does he think people cough on purpose? Has his focus on recording in a studio made him unaccustomed to performing in front of a live audience? This is Boston, and it is winter, and the audience is human. I thought seasoned performers tuned out the normal background hum from a full house. If any coughing from the audience had bothered him earlier during the regular program, then a shorter encore would have been appropriate. The review of the Schiff Goldberg Variations is worse than immoderate. Those who weren’t there might imagine from Mr. Moran’s account that Schiff’s performance was incompetent or lazy, but the opposite was true: Schiff operated at a transcendent level of engagement and mastery. In fact, I would say he realized his vision of these pieces to a remarkable extent. In all ‘fairness’, Moran confesses that he abhors Schiff’s vision of the GVs, and of Bach in general – I’m not all that sympathetic to it, either – but that particular prejudice is a very different thing than this: “…by some measure the worst professional piano performance this reviewer has ever heard” or “like a recital by a talented but ultimately not that good young student”. Really, Mr. Moran. By the way, this is the second BMInt piano review in a row – the first was Susan Miron’s abrupt, moralistic dismissal of Yuja Wang – where the reviewer’s ears and understanding have been sufficiently straitened to equate world-class pianism with student and local performance. As much as I appreciate the talent and richness of the local scene – and I do often find myself in its midst – I find those views provincial and would say some perspective-taking (or better listening) is in order. Nimitta: I was equally distressed by the mean-spirited tone of this article. That the writer did not like the performances is abundantly clear. But to take it a step further and compare a venerable artist such as Mr. Schiff to a student, and to suggest that Mr. Schepkin needed to smile more, seems to me to be both unnecessary and unprofessional. I like to think of BMI as a place for thoughtful and respectful criticism. I hope that in the future the publication might consider editing things such as this. Well, one should stand by what one writes, else modulate it. Incompetent rhythmically, sure, to my inner beat; never heard anything like it from a pro. Lazy, not at all, and I would not want anyone to so infer. Young pianists often have trouble with rhythmic strength and steadiness. Good teachers will still advise use of metronomes with certain composers. But I’ve gotten to say my piece and don’t need to belabor my view. Three other recent Schiff takes, Gantz in the Globe, Oestreich in the Times (not this recital but one a few days ago, of the Partitas), and a third in another local classical blog, show unbelievably different (in)sensitivity to beat. Seeing Deborah Boldin’s name among the commenters provides me the opportunity to thank her for the absolutely wonderful performance by Chameleon on Saturday night. As usual, both the programming and the performances deserve the highest praise. So far it hasn’t been reviewed, but I didn’t want it to go unremarked. So many pianists, including Angela Hewitt and several we’ve heard in the last few of months (Paul Lewis, Wu Han, Garrick Ohlsson) play with technical prowess, which they complement with soul, passion, heart, that to sit through what I thought was a rather bloodless rendition of some of my favorite music was disappointing to say the least. To my mind, what makes a great artist is the ability to communicate something other than an intellectual understanding of a piece or a technical proficiency. And to my mind, Schiff did not achieve that communication with his audience, at least not this part of it. So we went home and listened to Gould for a couple of nights to recall what makes these pieces so remarkable. He “got Bach’s motor” in spades. I was both amused and horrified by this bit from Schiff’s extensive notes on the Bach: “There will always be those who maintain that to play it on a modern piano is an abominable sin….To many others the tone of the piano is preferable to that of the harpsichord and let’s not forget we are talking about an hour and a quarter of music — hands on heart, can you listen to the harpsichord that long?” Really, in a program note for a concert in Boston, Early-Music-Town, USA? To start with the trivia: I was at the Schiff recital and I disagree with Margaret Sheperd; I thought Schiff’s reaction to the coughing was justified. Healthy people don’t develop coughing fits suddenly; sick people do. People come to concerts with maladies that result in coughing — colds, flu, etc. This is selfish. They should not be exposing those around them to their germs and disturbing the peace with their hacking. If you are sick, stay home. I agree with others who thought Moran’s review was “immoderate”. I’d go further and say he’s wrong, but we are talking about matters of taste, so he’s obviously entitled to his mis-guided opinion. My opinion is completely different, at least in the Bach. I don’t always love Schiff’s work in Bach (I heard Book 1 in NY at the 92nd St. YMHA and had tickets for Book 2, but Sandy prevented my return for the concert; I think there are times when his refusal to use the sustaining pedal is too extreme, e.g., in the c#-minor Fugue and bb-minor Prelude), but this is a great artist, a master musician and pianist. When you disagree with him, think long and hard. He may be teaching you something wonderful. And to accuse him of rhythmic flabbiness and playing without shape is just absurd. That’s like saying Roger Federer knows nothing about tennis. Beat time to the first 30s. Listen closely to the lefthand in particular. There is variety in Federer’s art, as there is in Schiff’s, but his back has been a problem, most likely the explanation for his sub-par performance this year (Djokovic said recently that Federer was “a yard slower” this year and at times Federer’s movement on the court has been far from the seemingly effortless ballet that we’ve become used to). Every listener and musician brings something different to the table. Some people are more moved by sound, or musical line, or musical architecture or rhythmic strength, or combinations of them. Mr Moran seems to have a predilection for “the beat”. I would prefer the term pulse, which implies a more natural flexibility, although I am not sure he would agree with that term, as he didn’t use it. I attend to that quality and use the word regularly. With beat I am perhaps emphasizing a cruder or at least blunter take on it, with pulse connoting maybe a little more flexibility, as you say (and I do agree). Most musics typically have both stomp and swing, of course, but this may be approaching hairsplitting. In any case, Schiff’s Bach lacks rhythmic strength by whatever name.